I have a bone to pick with your Roe v. Wade page. Not because it's inaccurate, I'm sure the facts are fine, but rather because it's boring. This whole thing is boring. Boring and dreary. Hippies standing along the street. People putting duct tape on their mouths. Hand-drawn sharpie on corrugated cardboard. And this constant bickering is carried out by the two most petulant, sanctimonious groups known to man- Christians and Feminists. A pox upon both their self-righteous houses. The exception are these guys- these guys I support. "Oh but Sebastian," I can hear you saying, "This is a very important issue to fetus-lovers and the condom-resistant alike and just because YOU aren't directly affected doesn't mean..." Bored. There you go; you've already bored me again. Not because it's not an important issue, but because it's a dead horse. Roe v. Wade is 42 years old. 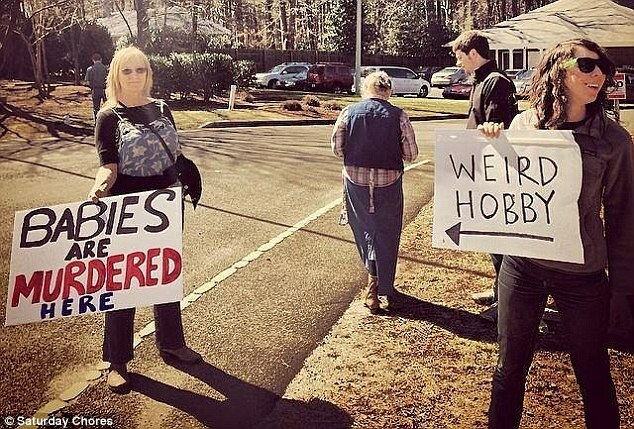 Both sides need to take a step back and find a hobby, especially the pro-lifers. I'd say they have about 80% of the blame when it comes to not letting this issue rest in peace, but it takes two to tango. And so then I had this incredible, Orwellian idea. What if we tricked them? People look up Roe vs. Wade on Wikipedia, they're like, "hmm, that's weird. I thought Roe vs. Wade was about something else... like maybe abortion or something like that, but I guess I was mistaken." 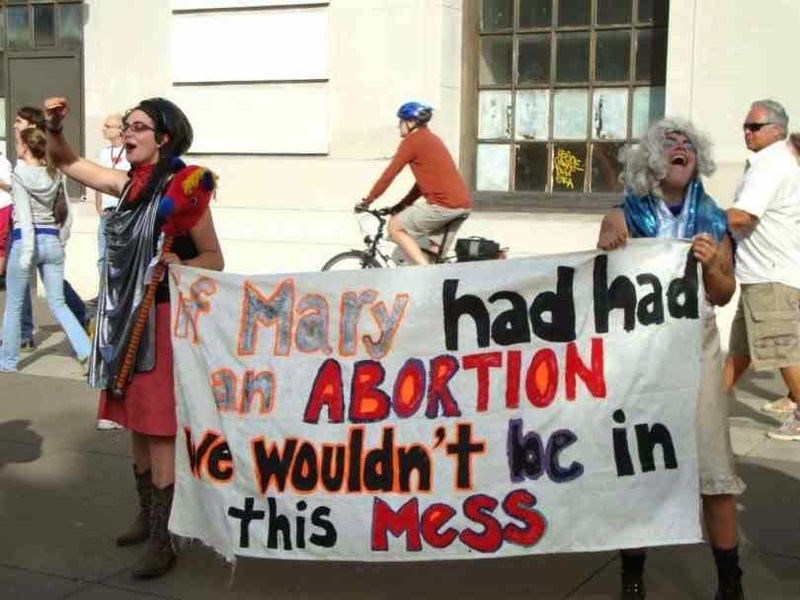 One by one people forget what Roe vs. Wade was even about. Women who need abortions go to Planned Parenthood. The church down the road just sort of... goes about their lives, completely unaware that they're missing an opportunity to be outraged. To make the transition easier, the new Roe vs. Wade Wikipedia article won't be too far from the truth. We'll just change the focus a little. In 1973, Janet Quincy Wade won her appeal in the U.S. Supreme Court and and set an historic precedent by becoming the first woman to choose professionally in the Professional Choosing League. Infighting and uproar reined supreme within the organization for several years after the court struck down the PCL's original ban on female membership, and the PCL eventually splintered into several sub-leagues. The largest of these newly-formed leagues (and the only one which still exists today) was the PLL, or the Professional Livers League, led by former pro choice President and trial defendant, Robert Roe. At the time many remarked that the division of the PCL into two competing associations was nearly the mirror inverse of the NFL / AFL merger, which had taken place in the decade prior. The rivalry between the remaining professional choosers and the new pro-life upstarts was at its most heated during the late seventies and eighties, but tensions remain to this very day. Robert Roe died in 1987 and participation in the PLL has declined slightly in recent years, although a large cadre of dedicated professional livers are still committed to the sport they love. While the PLL was also eventually forced to admit female members, the league remains dominantly male, while the PCL is about 71% female. Questions over the long-term health effects which both living and choosing may have on the human body have caused some controversy in recent years, but taken together the PCL and the PLL represent the third-most popular sport in America, after professional football and pro/am evolving. Janet Wade played professional choosing for several years after the landmark ruling but eventually faded into obscurity. She had one winning season and even managed to win the Chooser of the Week award near the end of the 1975 season, but many speculate that the tension of being under the constant scrutiny of the media created a stressful situation that ultimately stymied her professional career. A young Alice Wentworth remembers the 1973 ruling clearly. The legendary chooser was 12 at the time. "Janet Wade didn't just inspire me to pick up choosing, she inspired an entire generation of girls. There's no way I would have gone on to choose if it hadn't been for her courage and poise during that trial. There were angry crowds outside the courthouse every day. The media threw everything they had at her. I remember the police having to push the crowds back further and further because people were throwing stuff. Wade just kept her head held high. She didn't let it get to her. That's why she's a hero to all the women who play this sport. Always will be. She opened it up for all of us." Wentworth went on to become one of the most prolific choosers in the history of the PCL, with four Pro-Choice Championships, nine selections to the All-Choice All-Star squad, and over 400 career abortions. The PLL too has had its stars. Legendary liver John Zungenberger was born after the split but he has shared his views about the PCL with the media on several occasions. He's famous for his coarse, blunt manner of speaking. "F***, man. I just live. I just f****** live. I go out there every God-d***** day and I play to win. I don't particularly like choosers. I don't particularly understand what they do all day. But it's none of my business. I don't worry myself about it. I climb mountains. I watch sunsets. I motherf****** live. That's what makes me the best." That's how simple it is. Abortion business solved.